Ford first brought in the new-generation Endeavour to India in January 2016. It has been three years since its launch, and the flagship SUV hasn’t received an update. The American carmaker did add a panoramic sunroof and SYNC 3 infotainment to the SUV, but aside from these, there haven’t been any other updates in these three years. Now, the company is all set to bring in the face-lifted Endeavour to India, possibly later this month. At first glance, you may struggle to notice the changes in this refreshed model from the one it replaces. The updates are somewhat minimal and subtle. Up front, the grille now sports three marginally thinner slats in comparison to two from the model it replaces. The car also sits on a new set of alloy wheels. The bumper has been mildly reshaped and the headlights have now been re-profiled too. Inside, the Endeavour will look more or less identical but will have a noticeable difference in the touch and feel of things. The dashboard will be draped in soft-touch materials, there will be new chrome bits in the cabin and switches will now be backlit. The Endeavour face-lift will continue with the same Ford SYNC3 infotainment system but will now come with Apple CarPlay and Android Auto. In the international market, the Ford Endeavour face-lift comes with a new 2.0-litre diesel motor. This engine comes in two states of tune – a single turbo 177bhp/420Nm and a 210bhp/500Nm twin-turbo. Both these engines come paired with a 10-speed automatic transmission. Ford may not bring this engine to India just as yet, expect it to be introduced before the BSVI norms come into force in 2020. As of now, the Endeavour will continue with the 2.2-litre and 3.2-litre diesel motors, same as the model on sale currently. 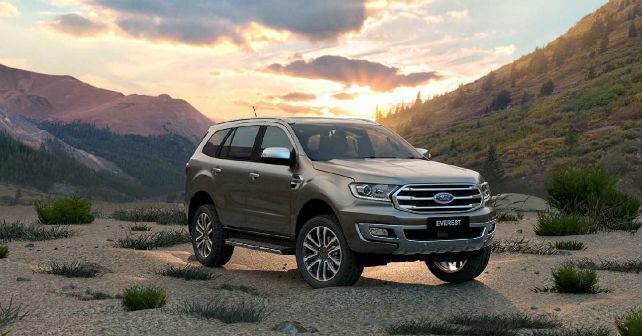 The Ford Endeavour face-lift is likely to be introduced later this month. Currently, the Endeavour is priced starting Rs 26.82 lakh. Expect the refreshed model to be priced marginally higher. It will continue to compete against the Toyota Fortuner, Isuzu MU-X and the Mahindra Alturas G4.